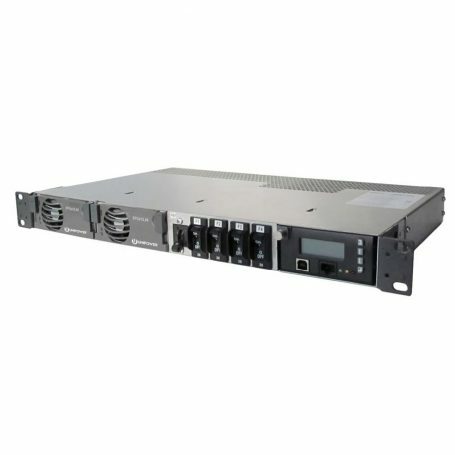 The Unipower Aspiro 1U is a compact 1U high 19″ or ETSI rack-mounted, integrated dc power system providing an output of -48Vdc. The system can accommodate 1 or 2 Aspiro family high efficiency hot-swap rectifiers. A total load + charge current of 45A / 2.4kW is available. The rectifiers are internally fan cooled with speed control which is a function of load and temperature, keeping acoustic noise to a minimum. Aspiro 1U features a low power version fitted with a 20A shunt to provide improved management of small batteries (<10Ah). This version is limited to a total load + charge current of 15A. The ACC extended remote access controller monitors system parameters, controls rectifier output, and provides alarms for system failures. The controller module is also pluggable for easy field replacement in case of failure. There are 2 LED alarm indicators which indicate failures, (RED) Alarm and (YELLOW) Message. A third green LED indicates the controller is working properly. As standard four form-C relay outputs provide the alarms for remote use. Two digital inputs and outputs are also provided as well as a micro SD card slot that accepts an up to 4GB card which is sufficient for more than 20 years data logging. The Aspiro 1U is compatible with Unipower’s free PowCom software which offers local and remote management through an advanced Windows GUI. 1U, 19-inch rack mount, 280mm ETSI compatible. Wide operating temperature range: -40°C to +75°C. Rear or side cable connection options. IEC ac socket connection option for Enterprise applications. Front-access distribution modules simplify in-service fuse replacement. A variety of MCB and GMT fuse configurations are available.